When I was young I use to steal food during summer vacation because my sisters, brother, and I were locked out of our house during the day, and we got hungry. I use to go to the same supermarket - there weren't a lot around in those days where we lived. Employees had to have noticed me after weeks of silent incursions with no purchases. Yet, no one ever confronted me. Once I saw a store employee look directly at me, as I slipped a package of lunchmeat down my pants. For a moment I saw something that surprised me. He gave a gentle smile and then looked away and went back to stocking shelves. It wasn't what I expected to happen if caught stealing. That little miracle of kindness affected me for the rest of my life. It's amazing how good it feels to make someone's day. There's lots of different things you can do. 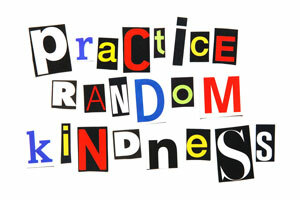 One of my favorites is committing acts of random kindness. When in line at a restaurant/coffee shop, etc., show your kindness by randomly paying for your own order AND the order of the person in line behind you, and expect nothing in return. This will make a person's day, and will hopefully motivate that person to pay this act of kindness forward. There really are endless ways to show kindness. Just ask someone how they are doing, and then really listen to what they have to say. We live in a violent world full of fear and hate, but it doesn't have to take our humanity away. Choosing to be kind can become a life mission full of rewards. If you really want to make a difference in the world practice kindness until it becomes a habit and you inspire others to do the same.